Gem of all desserts! That’s Black forest pastry and cake. Though originated in Deutschland (Germany) this spectacular dessert has conquered the world with its unique taste. Its known in multiple names like Black Forest cake (in US), Black Forest gâteau (UK) and Schwarzwälder Kirschtorte (in German). A typical Black Forest cake consists of multiple layers of chocolate cakes, with whipped cream and cherries embedded between each layer. These cakes are then decorated with additional whipped cream, chocolate shavings and maraschino cherries.. Try this preparation of black forest pastry and send me your comments and photos (its worth the effort). Sieve flour, cocoa, baking powder, baking soda and salt together. In a large bowl beat oil and powdered sugar until pale. Add 1 egg at a time and beat well. Add fresh cream and beat. Add in flour cocoa mixture and fold thoroughly. If the mixture is thick, add milk and fold well. In a prepared baking tin, add in the batter and bake in 180 d for 40 minutes. Let the cake cool completely. In a small bowl, mix sugar, water and brandy and stir well until the sugar dissolves. (If not using brandy, can be replaced with some essence or any flavor of your choice). In a steel bowl, mix the whip cream powder and water and whip for 3-4 minutes until its thick. Keep refrigerated. Take one round shaped cake piece and apply whip cream and press another round piece on top and again apply the cream on the outer portion of the cake and sprinkle grated chocolate on the cream. Prepare all the cake pieces like this. Then pipe some cream on top according to your design and decorate with cherries. 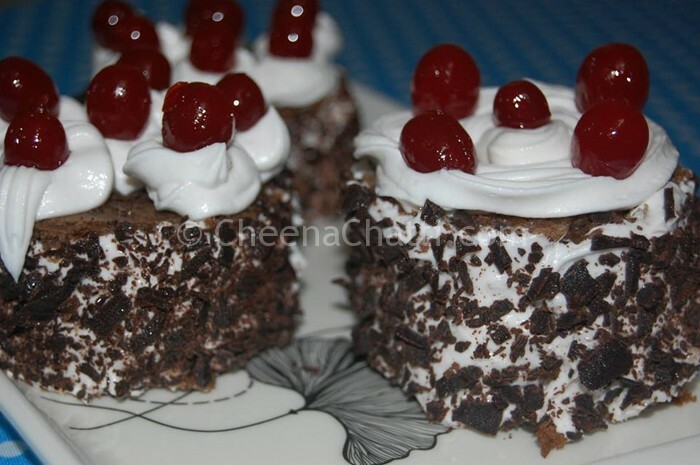 This entry was added on August 6th, 2013 by Athira Sooraj in Bakery and tagged with baked, black forest pastry recipe, black forest, how to make black forest pastry, best black forest pastry recipe, black forest pastry, pastry, black forest pastry recipe indian. Last revised on April 4th, 2018. Friends, I am Athira Sooraj, a passionate home baker! :) I prefer to share simple Food Recipe for beginners and I just love cooking experiments..
Eggs sd add 3 r 1? 3 eggs total. But add them one by one to the batter. So that your batter wont be spoiled in case rotten eggs are there.